Companies are developing their corporate citizenship approaches and strategies based on three primary drivers: aligning with their purpose; addressing an operational issue; and/or supporting the communities where they have operations and employees. Public media and high-profile stories surrounding companies and their corporate citizenship efforts tend to focus on the major programs and initiatives that the company has developed and promoted, such as Unilever’s Sustainable Living commitment (Purpose) or Starbucks’ focus on sourcing products responsibly (Operations). The approach to community, however, tends to be less developed. 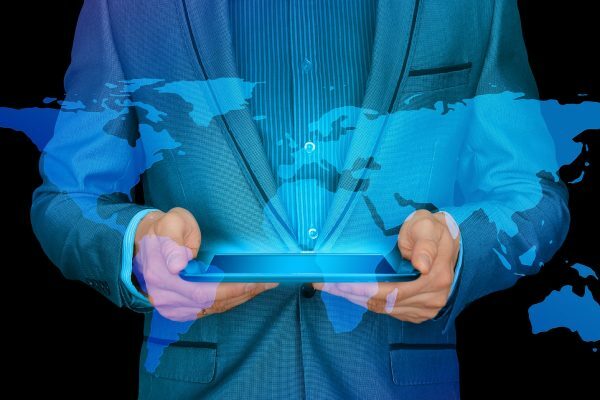 Numerous companies state that they support the communities where their employees live and work, but with employees scattered around the globe in possibly hundreds of locations, companies struggle to develop an approach that effectively meets the needs of their various stakeholders in all of their localities. Companies experience an increasing pressure to address critical issues, as well as communicate the activities and impact of the company in the communities where it operates, even in the most rural locations. As a result, there is a greater need for companies to develop an approach that addresses the issues and concerns of those stakeholders. As a starting point, companies are beginning to strengthen their approach to supporting the community due to the interest and availability of employees as volunteers, as well as through a company’s ability to lead and organize collaborative efforts with community organizations. How should the approach differ in a headquarters community (possibly in a large urban area) versus a rural community, where the manufacturing operations may be located? How should the approach be customized to each location, taking into account the existing infrastructure or ecosystem that exists to address the issue or issues important to that community? How should the approach vary based on stakeholder expectations, including employees? How can the approach work with limited staffing capacity in certain locations? 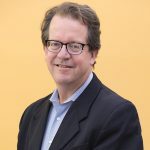 To help our clients answer these questions, we have developed a process and a set of criteria – which ultimately leads to the development of a higher impact approach focused on priority communities – based on a number of factors, including a company’s strategic goals, internal capacity, community infrastructure and needs, and stakeholder expectations. Developing a clear picture of your current situation is a necessary first step before determining a strategic approach. TCC Group has developed a three-phased process– Phase I: Mapping Your Communities; Phase II: Assessing Your Communities; and Phase III: Developing Your Approach – highlighting some of the relevant questions that can help a company decide on an approach. The analysis should include a clear picture of your current work in your communities and the existing infrastructure or ecosystem that will help you identify where to focus your resources and attention. How well are you meeting stakeholder expectations? The following steps will provide the information needed to help you refine your goals and strategic approach. Step 1: Assess Expectations and Performance – What does a community expect from your company? What is the level of need for a specific issue in a community? What do stakeholders expect you to do to address that need? What level of support do they expect (we have identified five levels – leading,partnering, supporting, participating, or no involvement)? How well are you currently meeting those expectations via current programming? How should resources be reallocated and prioritized to align better with stakeholder expectations? 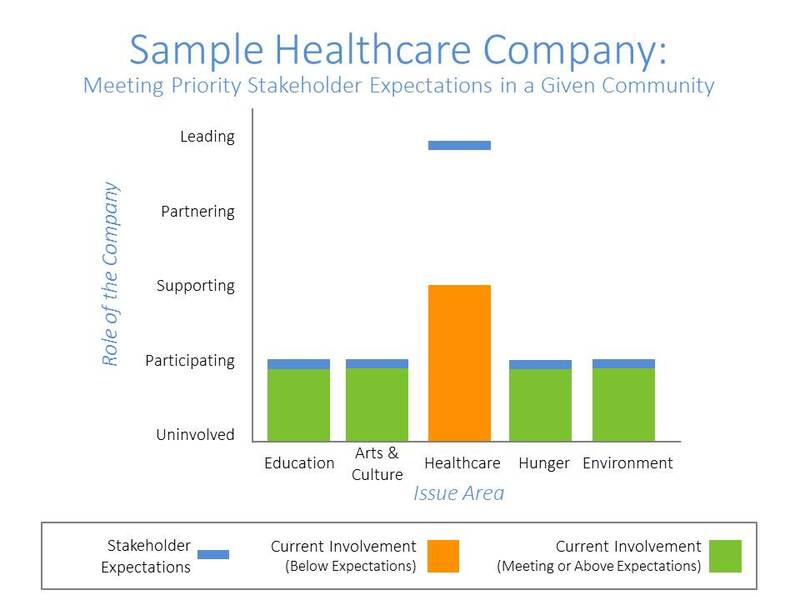 The graphic above shows a typical company approach to community, using a healthcare company as an example. The community expects this company to address local healthcare issues, given its expertise and ability to address the issue. But the company is providing a relatively equal level of support to a range of issues in the community. Step 2: Prioritize Your Communities – How can your company make an impact? 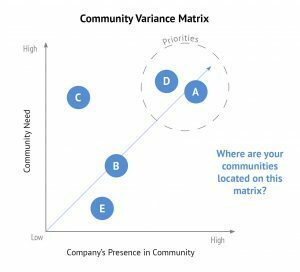 Determine which communities are most important, and may need additional resources and attention. This is especially critical when a company has multiple locations and limited resources. Which communities have the largest gap between their expectations for your company and its support of the community? Where is stakeholder pressure to address a community need the highest? Where do you have the ability to make a meaningful impact based on resources, staff capacity, and community infrastructure? Which communities are priorities based on business growth and expansion or other environmental circumstances? Communities can be prioritized based on the level of community need and the company’s presence in the community. Companies with a major presence with high community need tend to have high stakeholder expectations. Step 3: Review Issue Expectations – What are the priority issues for each community based on stakeholder expectations? Determine whether there is an opportunity to identify one issue that the company needs to support and whether it aligns with the purpose of the company and/or issues relating to an operational issue. Is there a consistent set of issues across all communities? Do they align with issues currently supported by the company? Does it align with the purpose of the company? An operational issue? Or is it an issue unique to the community? How do employee expectations align with other priority stakeholders? The outcome of this step will help the company identify potential approaches to community engagement. 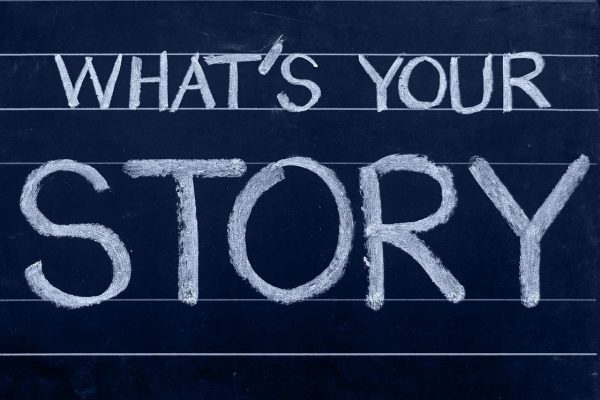 If these questions are difficult to answer promptly, we recommend engaging a two-part advisory council—a local advisory council (or national, if possible) of key staff and community influencers; and a core working group of individuals leading your companies social impact development. During the second phase, this local advisory council can help with Step 1, by collecting the data with regards to the needs of, and resources in, each community. Meanwhile, an internal working group can help with Step 2, by gathering data on stakeholder expectations, and eventually Step 3 of aligning these needs, resources, and expectations with the company’s ability to make an impact. Based on the data you have collected, if there is a consistent issue across the communities that aligns with stakeholder expectations, then a signature program focusing on that single issue is an option. If the communities’ issues are broad, and the stakeholder expectations are not high, then a set of broad focus areas with low impact goals may be the correct choice. Or, if each community has a unique set of issues that require attention, a customized approach will be the best choice. The level of commitment to addressing a community issue should be based on a number of criteria. What is the level of stakeholder expectation to solve the problem versus being at the table? What is the ability of the company to have impact on the issue? Are there skills, expertise, resources, and/or funding that can be applied? What is the capacity of the community to play a role – are there organizations with capacity that can serve as partners? Goals for each community need to be based on an understanding of the potential for impact. Once the goals are developed, a company needs to develop the strategies to achieve the goals. One of the more difficult issues that companies face is the limited staffing capacity available in many locations. During the development of the strategies, companies will need to ensure they have the internal capacity necessary to implement the revised approach in their priority communities. Following these steps will help a company identify priority locations—headquarters, local, or a combination—and determine how their current approach needs to be refined to more effectively meet stakeholder expectations. What Does It Mean To Be A Strong Corporate Citizen?